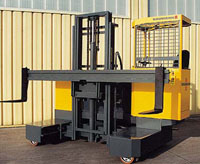 Sideloaders handle long materials efficiently through narrow doorways and aisles. A sideloader truck picks the long load from the side, lifts and retracts it onto the sideloaders bed and transports it lengthways within the warehouse, plant, or in the yard. Sideloaders, more correctly described as Sidelifts, are available in electric, diesel and LPG propulsion. All electric sideloaders have four-way multidirectional capability by not only turning all wheels 90 degrees, but also steer them. 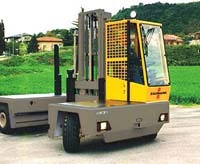 This enables the sideloader to drive and steer in normal forklift mode, as well as in the side loader direction. 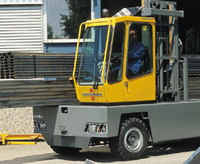 4WAY Lifts offers Sideloaders in wide capacity ranges and specifications with electric, diesel and LPG propulsion. 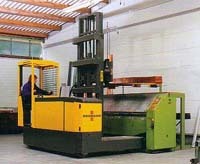 Good used sideloaders in a broad selection from multiple brands are available as well. 4WAY Lifts specializes in long load material handling by consulting plant and warehouse managers in order to find the most efficient and economical solutions to all sideloader applications. We support our customers through an extensive forklift dealer network, superb parts support and competent service consultation. Call 800-927-0385 or +1-630-553-7755 or contact us at info@sidelifts.com. Please take advantage of our substantial knowledge in handling long and bulky materials. Benefit from our experience reaching back to 1977.